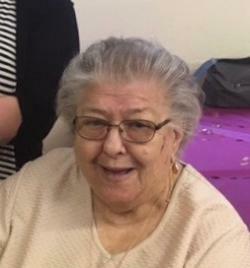 Alice Arsenault, 78, of Bouctouche, passed away peacefully, at home on Wednesday February 6, 2019. She was married to Alvin Arsenault. Born in Saint-Louis, she was the daughter of the late Frederick and the late Edith (Vautour) Comeau. Alice was well known in the community for her involvement is many organisations; she was a volunteer for Saint-John Ambulance for several years. From a result of all her involvement and volunteering, she became a recipient of the Rotary Paul Harris Fellow Award, a Golden Jubilee Medal and recognition from the NB Governor General. She will be sadly missed by her husband Alvin, her daughter Thérèse LeBlanc of Moncton, her two grandchildren; Lucie (Jacques), Claude (Amy), her four great grandchildren; Christelle, Janelle, Monica and Amélie as well as two great great grandchildren; Damien and Lily. She also leaves to mourn her sister Dorina Collette (Joe) of Sainte-Anne-de-Kent, her three brothers; David, Irenée of Bouctouche and Éverard of Richiboucto, a special niece, Murielle Comeau of Bouctouche and several nephews and nieces. Visitations will be held at Maillet Funeral Home, 29 rue de l’église, Bouctouche on Monday February 11, 2019 from 2 to 4 and 5:30 to 6:45 pm. Funeral Mass will be celebrated at the Saint-Jean Baptiste Roman Catholic Church, Bouctouche on Monday February 11 at 7:00 pm with interment in the parish cemetery in the spring. In Alice’s memory, donations may be made to the Moncton Lions Sick Children Fund or to the NB Diabetes Association.